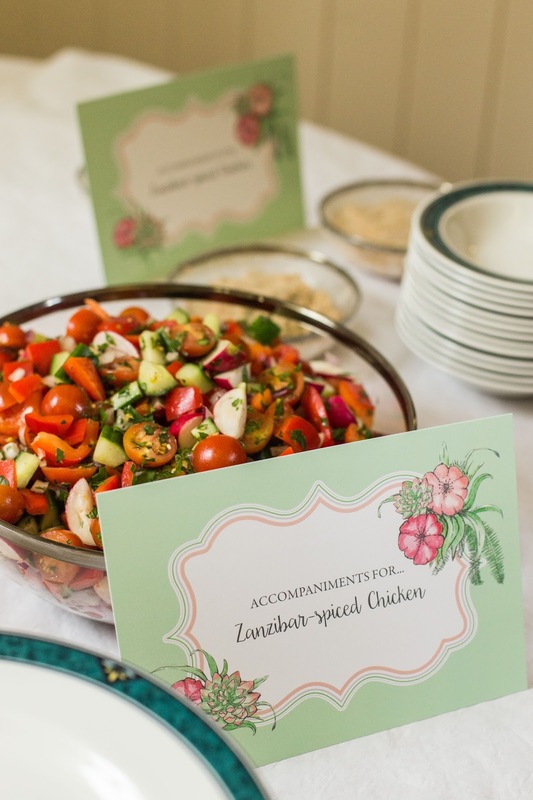 Lizzie's Tasty Journey: Post Wedding Day Blues- Inspired BBQ flavours! Post Wedding Day Blues- Inspired BBQ flavours! I keep looking at our wedding pictures and drooling at the sight of all that deliciousness. I was so excited and nervous about everything going well that I didn't actually eat that much of it on the day. But I can still smell the BBQ's big smoke and feel the warmth of the day! We didn't want a standard formal wedding day lunch but more a feast of flavours and options reflective of foods we love. That's why we were thrilled that our big chef-pal Dave agreed to help us out on our big day and wow... did we enjoy the planning stages! Discussion took place over a cheese board at our house one late February evening and came to fruition on an early May windy day in Dave's back garden! Lots of tasting, development and a few recipes later and we were somewhere near our dream. A few points of non negotiation were agreed. Firstly, the food and the preparation would very much have to be a collaboration of friends, family, ourselves and Dave. 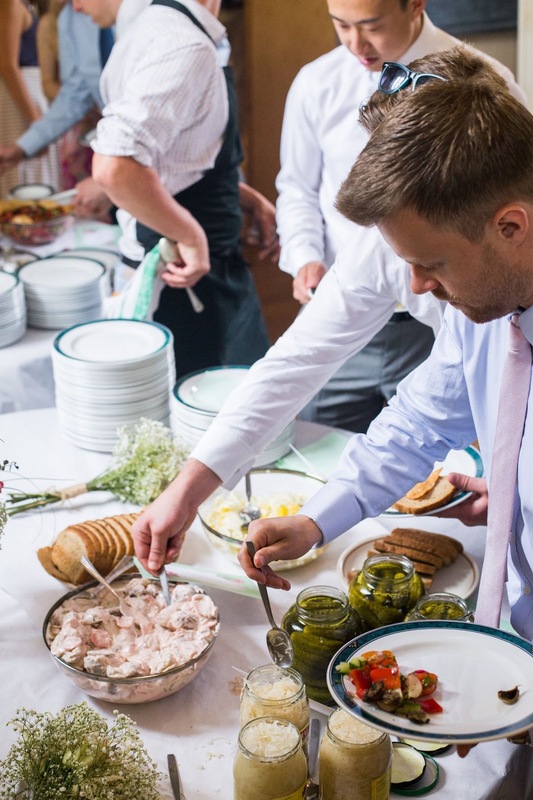 Without a professional wedding caterer and the security this would bring, everyone would have to help out. Mucking in and improving their knife skills would be a condition of our nearest and dearest attending the wedding! 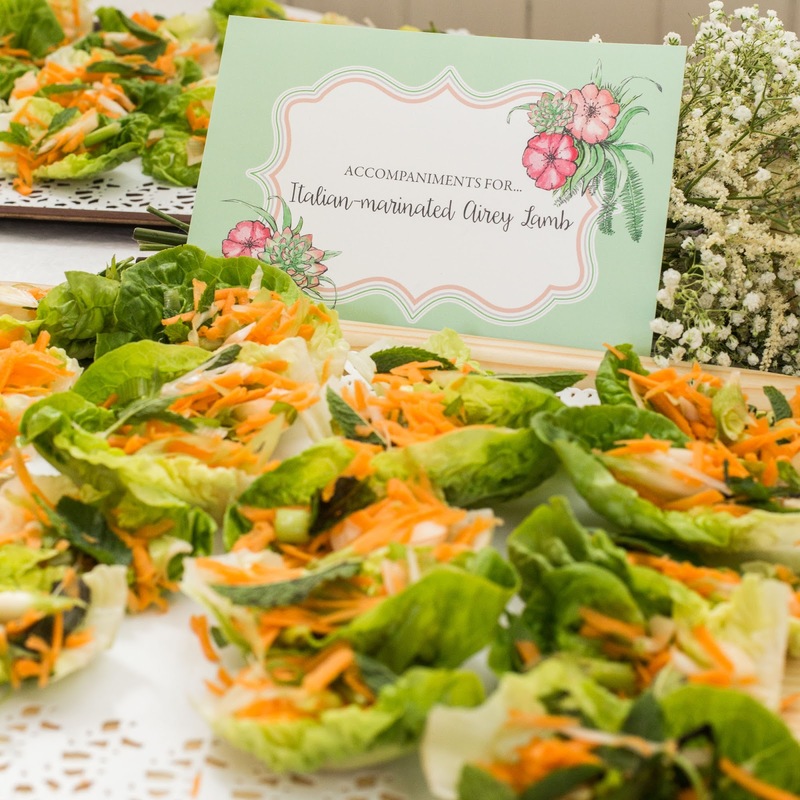 We didn't have loads of money to pay a caterer and due to Tom and I working in the catering industry ourselves, it was frustrating that we knew what we wanted to do and how to do it, we just couldn't physically do it on the day ourselves! We planned a preparation day the day before the wedding and we put our faith in them all to make our dream a reality. Secondly, we wanted to incorporate best man Rob's lamb. Rob is a sheep farmer hailing from Yorkshire but farming in Northumberland and his gift to us on our wedding day was one of his very own sheep! Dave was definitely the man to give this delicious gift its rightful place within the menu. An Italian marinade of anchovies and rosemary and garlic proved an incredibly popular choice. Thirdly all the food should be downright delicious. We would never live it down if the food was a disappointment. We had no doubt with this team around us, we could deliver! What we had at Sawley Village Hall, was a rather large basic kitchen with four gas hobs and a domestic amount of cooking space and apparatus. We didn't consider that using a fold away wallpapering table in the centre of the kitchen would pose a few problems for our 'chefs' who, with direction from Dave and Tom, ploughed through an army's worth of food. It didn't help that the willing helpers were a little hungover and overwhelmed by the sheer volume of salad prep... after a couple more beers they began to feel a bit better although the table movement made them feel as though they were working at sea! We agreed we would utilise the BBQ space outside the hall on the veranda and have three equally tempting meat dishes and a vegetarian option. Guests could choose the meat and then the accompaniments to complement the dish. We wanted one dish to be inspired by our honeymoon destination of Zanzibar. Dave was handily familiar with east African cuisine as his sister lives in the region and he had tasted the flavours while out visiting her. Traditional Italian Antipasto - cooked meats, olives, mostarda fruits, turnip tops, chickpea pate, pea puree, selection of breads. The BBQ flames became a little engulfing on the day as the canopy we had erected to shield from any potential rain, had the effect of encasing the smoke and the glorious sunshine laughed on, leading to streams of tears and struggles which further exemplified the amazing efforts as the team carried on regardless! A standing ovation for Dave and his assistant Jed echoed around the hall and went some way to thanking both for their determination! Along with an amazing force behind the cooking, our talented bridesmaids designed menu cards for the tables which matched our invitations and colour scheme! The BBQ and accompaniments looked beautiful and were a testament to all the lengthy chopping. Well done boys. (Might I add the girls were busy titivating the hall). Salad cups for Italian marinated lamb. The collaboration continued into dessert as we had asked a selection of willing ladies from the guests to bring along a cake for our dessert table. The WI would have been proud! Mik and Sara captured the food with some gorgeous shots and I can't thank any of them enough for their efforts on the day. So Happy with the delicious food! Well done everyone! Our handsome groomsman; Best Men Rob Airey & Ben Taylor, Declan Hoare, Mark Eyton Jones and Grat Maslin. Brendan Walsh, coming over from the US of A to be our Master of Ceremonies and providing further eye candy. Jenny Culver, and her wonderful chocolates, a perfectionist to the last! Emily and Rich Chapman, their fancy hall dressing skills are a must, plus thanks for the bread delivery and calming manner! Stuzzi of Kings Road, Harrogate gave their amazing authentic Italian wares! Yummy. David Haynes’ mad BBQ skills, general appreciation of lush food, excellent idea generating and ‘great guy’ persona. Nikky Manning and Sam Barber; hanging on to all that wedding paraphernalia helped us out loads! Pete Manning, his cheese knowledge and safe cheese carriage all the way from Settle. Paul and Vicky Spencer for their generosity, helping us arrive in style! Pauline and Bob Berry’s kind efforts creating the amazing flowers and offering supportive green fingers. Brian Kerrigan for hooking us up in the first place! Richard and Janis Ellory discussed pros and cons of beautiful platter boards at length before agreeing to help make the dream a reality. Hopefully not too many splinters! Jennifer Milligan and Jennie Webber provided our gorgeous invitations, what awesome teamwork! Rebecca Arthur is available for fabulous hair like ours and embodies the wedding ‘support’. She’s here because of the cat that ruined the plants... to prevent further nervous breakdowns! Mik and Sara are professionals- available for photography, capturing the day in their relaxed and creative style! Absolute treasures, both of you! Rob, Zoe and the Airey’s, their fine lamb and hay bales, plus the effort lugging it all! Bettys and the Walker’s for all your jars! Jane Ellory, Nana and Victoria Ellory for beautifying them! The readers; Beck Penston, our beautiful mothers, sisters and brother! The dedicated team of cake and pie makers! Your delicious treats are an inspiration and made our day even more personal and special. Can’t wait for a nibble! Sawley Village Hall- Stuart at the bar and Rachel for finding that extra table. Set up crew! Hope you enjoyed wedding day-eve as much as we did! Our wonderful families for their constant support! Everyone else for being here to share in our special day! You have all contributed in so many ways we cannot possibly detail. We couldn’t have done it without you. I'll meet you in Strasbourg!